Previously, on MinerBumping... 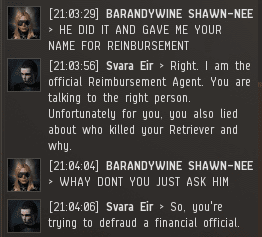 Agent Kalorned killed BARANDYWINE SHAWN-NEE's Mackinaw and referred her to Reimbursement Officer Svara Eir. 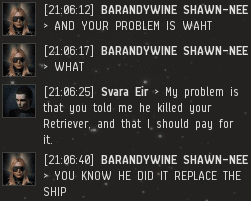 Svara wasn't surprised that the miner wanted free stuff, but she was shocked when BARANDYWINE demanded the reimbursement of a Retriever--which had been killed in 2011 by NPCs. 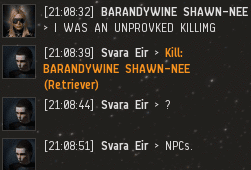 Thus far, Svara had bent over backwards to help BARANDYWINE. But now she had no choice but to voice her displeasure with the miner's conduct. 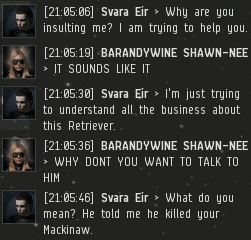 BARANDYWINE stuck to her story: The Retriever had been killed when Kalorned called in an artillery strike against the ship. Next, the miner tried to pull a fast one by linking the Mackinaw lossmail--from a completely different incident. Svara caught it immediately. Miners, don't bother with tricks like this. Nothing gets past an Agent of the New Order. 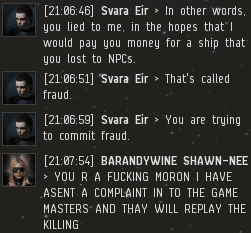 BARANDYWINE's story was unraveling. 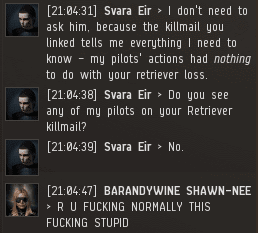 She deflected, referring to Kalorned's termination EVEmail. I guess if you spend enough time AFK, you forget how to use one. The miner had entered the conversation hoping to get a Retriever loss reimbursed. Now the stakes were much higher. As Carl Sandburg once said, "If the facts are against you, argue the law. If the law is against you, argue the facts. If the law and the facts are against you, pound the table and yell like hell." 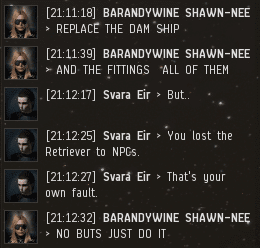 BARANDYWINE was a stubborn one. 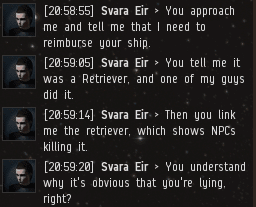 Despite a Retriever lossmail clearly showing her loss was due to NPCs, she simply would not give up. The miner seemed to be absolutely convinced that the lossmail was wrong and that Kalorned had destroyed the Retriever. Or, possibly, that Kalorned "ordered a strike" carried out by NPCs. Whatever the reason, BARANDYWINE was confident that if the GMs showed an instant replay of the gank, it would show Kalorned was responsible. Svara sighed. 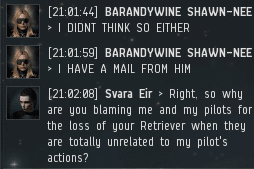 Trying to reason with BARANDYWINE was like talking to a block of Veldspar. The miner didn't care about facts, logic, or the Code. 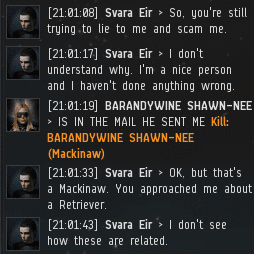 BARANDYWINE only cared about isk. She repeatedly demanded money from our Agent. Unfortunately for BARANDYWINE, she was dealing with a Reimbursement Officer who cared very much about facts, logic, and especially the Code. So far, their argument was a stalemate--but not for long. Ughhhh :) A caring Code officer. Those are the WORST! "I guess if you spend enough time AFK, you forget how to use one." Oh man, I reread that line twice somehow not getting it. But now it dawned on me and I exploded laughing. Comedy gold right there. In game of course, you Kalynn wannabe shitters need to calm down. Miner. In the meantime I guess I will have to settle for some awoxing. Why wont antiganking release their donation list? ?